Enter to win a bag of Whiskey Barrel-Aged Sulawesi! Write a comment below telling me why you want a bag of this special coffee. It can’t be a super short, meaningless comment like, “I’m writing this comment because you told me to write a comment.” There is an element of subjectivity to this because I’ll delete comments that are one short sentence that don’t say much. However, please do not write a book either. You could say anything like, “I want to have this with a fabulous dinner!” or “I want to share this with my partners!” or whatever suits you. I’m going to draw a name at random. You must leave a comment before 5:00 PM (PST) on September 18, 2017. Your odds of winning depend upon the number of entries. You must be over age 18. You must have an address within the United States. The retail value of this coffee is $32.00 and there are no prize substitutions. I’m not expecting a very large number of entries given the short period of time to enter. I know you’ll love this coffee if you are the winner. Now is a great time to recommend that you look at the Four Fundamentals of a Great Cup of Coffee. Since this is hand-scooped coffee, you’ll want to follow the special freshness rule for coffee that’s not in flavorlock packaging. This sounds like the idea coffee to finally perfect my pour-over technique, as much as I enjoy watching others do it for me. Just feels like something I’d love to learn, and share with my wife. I would love to indulge in this well crafted whole bean delight! Anything cultivated and aged with this amount of time would give my heart some warmth. Hopefully take me places as I sip in the afternoon watching the sunset with the perfect caramel turtle cluster. Defenatley share and discuss while adding it to my passport of goals! I want to win this coffee to share with a dear friend who introduced me to tasting whiskey, and who I introduced to tasting coffee. I would ❤️ to have this as its the one coffee that really makes me sing a happy tune! Truth be told its only 1 of 3 in total I like from Starbucks. Thx Melody. Love it! I loved when it came out in March and sold out so quickly! Looks like an amazing coffee, would love to try some on a lazy Sunday morning! I want to win this because i am a partner at Greece and we dont have reserve coffees in our market,only the core coffees .This would be one of the kind experience because the most sites that sell that kind of beans doesnt ship to Greece either. Have a great day everyone full of coffee!!!!! I’m in love with tastings coffees especially the reserve ones, and this would be one of the most unique coffees that would be so special to taste. Would make a very special tasting for partners and regular customers. I would love to win this bag of coffee so I can present it with a perfect pairing to share with my DM at my coffee tasting. This is not an ordinary coffee tasting this is will be the completion of my coffee master. Just before I finally recieve my black apron. Having an amazing coffee from Seattle would just make it that much more amazing. I would love to be able to research this coffee and present it with so my pride. I’d like to win this because my SIL owns a coffee shop and I’d like to see what she thinks of it! I was fortunate enough to try this coffee at the Los Angeles Reserve Bar, but unfortunately they did not sell the beans. Would LOVE the opportunity to share this coffee with my partners not only in my store, but throughout my district. Thanks for all you do Melody! I would love to win this coffee because it is one of my favorites that starbucks has come out with in a long while. It is one of those coffees that I love to share with people, to show them how innovative starbucks really is! I used to live in Scotland and have loved whisky ever since. Have loved Starbucks even longer so the combination of combining those flavors sounds like a dream. Even if I don’t win, I need to find out if the nearest Reserve has it because I’m so excited to try it. This is the perfect combination between two God miracles. This is the perfect gift for a 12 year partner like me in Starbucks PR. Wow! This sounds amazing! Back when I worked for the company, I gave a coffee tasting before a meeting using Sulawesi, whiskey fudge and smoked cheeses. I bet this is delightful. Thank you for all of the passion you put into your content! I worked for Starbucks back in the day when Sulawesi was a core coffee and since we were a new store my store manager all assigned us a coffee. My manager said that I was his “Sulawesi Boy” because I looked like the monkey on the bag. I would love to try this coffee and have a French press Friday with the partners at my store . It would be excited to taste this limited one of a kind batch and come up with awesome food pairIngs. I would love to try this coffee! I would have it with coffee cake for a relaxing weekend breakfast or after dinner with a sweet treat. This coffee sounds delicious. I would love a chance to try it. I would love to share this coffee with my husband – he was never a coffee drinker but I’ve slowly been introducing him to different coffees & he’s really starting to appreciate it. I think this would be the perfect coffee to truly win him over because he loves whiskey. Well now I’ve written this three times I think. This must be the right place. ! Basically I’ve said how fun it is to share something new with my loval Sbux, 2470, Justine Pacquer & crew. A lot of them are young and new but have been trained so well, they are eager and open minded need. They strive, as does the whole store, to serve customers with the original spirit of Sbux… although in this new bldg it’s not easy… they are all so busy with the drive.- thru and everyone in headphones! ( too many voices). But they make it work. That’s essentially why I’d love to bring in this special coffee for all of us to share! I am dying to try this! It looks so delicious! The Starbucks Sulawes is my absolute favorite since I worked for them in 1997-2000. Now being I have never tried or even seen this rare brand, it would be a delight to have this on a crisp fall morning ( or night) or during the holidays ( if ti lasts that long, which I must admit, it will not) Thank you for doing this for the Starbucks coffee lovers of the world. I saw this on the site yesterday and got excited. I have heard about it before but was never able to get it. Now that it’s back, I’m really excited, maybe I can try it before work or with my wife. Than coffee beans aged in barrels post-whiskey? I would love this coffee because not only have I been fan-girling over it since it was mentioned, but I am going to be working at the new and first Reserve Bar in Michigan in Birmingham! I would love to share this with my co-workers and possibly also do some cold brew with it. Not to mention, I’m a baker and would love to incorporate it somehow in my baked goods! Quite possibly as a bread or cake. The Roastery is so so far away. But the coffee sounds so attractive. There is no way to get the coffee, but from you. I will pay extra expenses if I won. I was a manager in a reserve Clover store for over 4 years ago. I miss the excitement of introducing my partners and customers to new unique tastes Starbucks is dedicated to. The reserve selections have always continued to impress and inspire me. I would love to share the uniqueness of this coffee with my partners and special customers! Plus, whiskey and coffee in the same profile! YeaH! I would love to win because I’m a coffee addict and this one sounds very interesting. We just visited the roastery on pike here in SEA on the weekend to specifically try this magical experience (we live in Ballard and got up super early to beat the rush) My wife happened to try the first batch of whiskey themed coffee way back in March which was the first outing we had with our new born baby so this was a special experience as I rarely get to see them both on the weekend and it brought back memories of that time. Not only was the cold brew amazing but the staff were so kind and considerate (but not at all ‘in our face’) considering how busy the place is it really showed me that Starbucks gets it right when it comes to customer service. We would love to have a reminder of this special moment sharing an unusual and wonderful coffee experience. This sounds so beautifully crafted – what an amazing balance. Plus it would be great for my birthday 🙂 thanks for all you do Melody! Whiskey and coffee…2 of my favorite things. I would love to win this coffee….Now if they did the trifecta; coffee, whiskey, and bacon…..one and done. Wow, this delicious and now I am left wondering how to pair this unique combination of flavors. Sounds like a wonderful combo, would love to try it. What a unique blend of coffee! 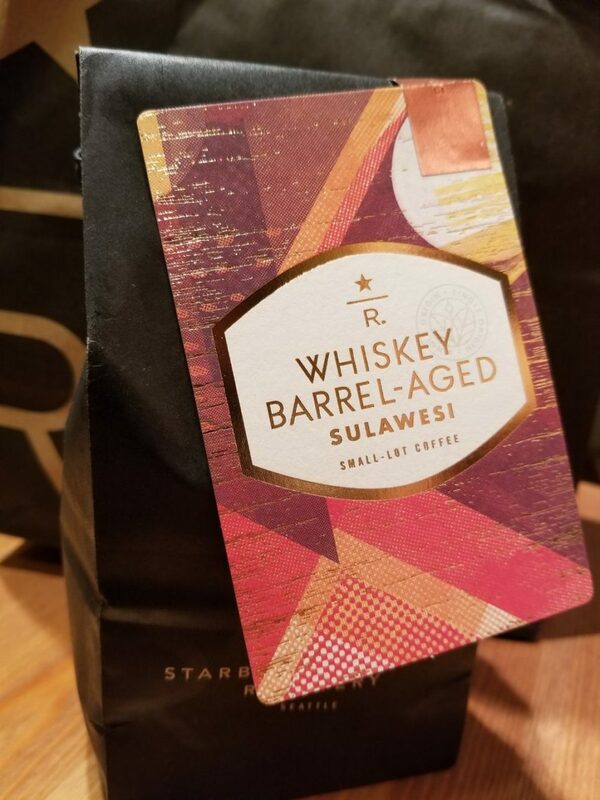 You can never go wrong with coffee OR whiskey, so I can’t imagine what this barrell-aged Sulawesi roast will taste like! There were 43 entries. I wrote all the names on cards and I’m going to ask a barista tomorrow to pull one out of a Starbucks bag. This giveaway is closed and has been since 5 pm (pst) yesterday. The winner is William Janssen.